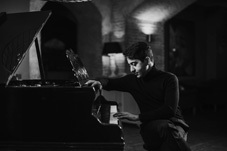 Luka Okros, a Georgian pianist, has established himself as one of the most promising pianists of his generation. His performances have been praised by critics as “intense, strong and natural, with an impressive creativity”. Luka gave a concert in Tbilisi on April 6, where he performed music by Liszt and Schubert along with other compositions. The Messenger had a chance to interview Luka Okros and discuss upcoming plans. -How would you sum up the concert in Georgia? What were the feelings it brought you? Concerts in Georgia, especially in my hometown Tbilisi, are always something very special to me. The concert on April 6 brought incredible emotions! All seats were sold out already in the morning of the concert. I surprised the public and performed my own transcription of dance from Paliashvili’s opera. I have performed it in other countries before, during this season, and it was dedicated to the 100 years from founding the First Georgian Republic in 1918. I received an unforgettable amount of energy from the audience during the whole concert; playing it in Tbilisi was something really special. This trip was short and very busy. I was invited to several TV and radio channels. I want to thank all journalists and producers for giving me the opportunity to share my thoughts and future plans on their platforms. -What is a good live performance for you? It should have some magical moments, where the public can’t even breathe, I know exactly where and when these moments should appear and my job is to deliver them correctly to the audience. -What were the things you had to overcome in order to become a better performer? This is a combination of lots of things. Every day I have to fight with my laziness and practice a lot to keep everything on a certain level. One should always be motivated to work and move on, even when things are going in an unexpected and not always pleasant direction. It’s very rare to find myself satisfied by a concert; I can be very demanding, first of all to myself. Probably it is all about perfectionism. It’s a huge work, which makes life very intense, but at the same time - very interesting. -What can be done in terms of developing the music industry in Georgia? I’d say we should bring a tradition of donations and scholarships within the country. Private sector and the government should be more involved in developing art and cultural education in general. Probably the government should propose flexible taxation system to the art donors to increase the percentage of people and companies, who want to support art. Smart management is needed in this field even more. Also, mass media should support cultural events and activities to attract more attention. The industry in general needs reforms as well as we need to deliver the importance of art to the public and increase demand within the younger generation and develop systematic art education in society. Even professional music education needs to be updated, in order to fit reality and life which is very fast, practical and intense. -What or who was your biggest influence as an artist? From my childhood I adore Rachmaninoff. His music and his personality influenced me a lot throughout my life. I am lucky to have the possibility to meet a lot of interesting people all over the world. Some of them are a true inspiration! They give me the courage to achieve my goals and dream bigger. I’m inspired by mother-nature, films, and books, food, and architecture, there are so many things which could bring lots of thoughts, and it’s just about the vision. You have to be able to see things from a different angle. -If you hadn't chosen for music, what do you think you would do right now? Lots of different things, starting from cooking, designing, architecture, management, or could be photography. I think I’m lucky to have some kind of vision, how things should be done, which would help me in many careers. -Tell us about your upcoming plans. After Tbilisi, I’m off to Kiev, Berlin, Luxembourg, Beijing, going back to Amsterdam in June. Highlights of the summer will include a recital in London, where my new CD with works of Chopin will be released, as well as my debut at the Teatro Solis in Uruguay and as far as I know, it will be for the first time that Georgian pianist appears on that legendary stage. Besides concerts, I am working on my own compositions. Few of my pieces have already been published by the UK-based company Master Music Publications and more are coming soon. I’m looking forward to upcoming projects and excited about concerts in 2019/2020 season, which will definitely include Tbilisi next spring.